Surround sound reverberated through the cushioned seats with every dramatic moment. 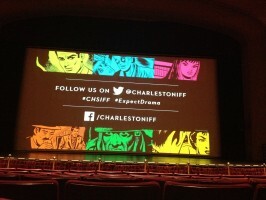 Day 2 of the Charleston International Film Festival danced across the screens of Sottile Theatre, enlivening tales of laughter, struggle, and victory. Featuring longer programs such as “The Last Safari” and “3 Mile Limit” accompanied by heartfelt and heart wrenching shorts, Day 2 was a cannot miss. Each block was scheduled to carefully supply the audience with a balance of comedy, drama, and tear-jerkers. Subjects ranged from stories of young friendship to defying societal odds. 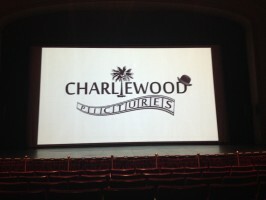 Charliewood Pictures, one of the hosts of the festival, focuses on the local talent within Charleston’s cobblestone streets. Many students at College of Charleston or members of the community were able to submit their pieces for promotion. The local focus featured many scenes that Charlestonians pass on a daily basis, or were centered around local artists such as Becca Barnet (“Fishhooks”). 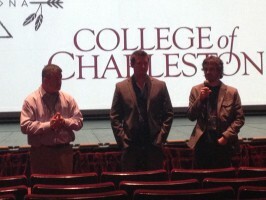 Yet aside from the focus on enriching the film community in Charleston, producers and directors both global and national were in attendance. From an aesthetic perspective, a particular eye-catcher was Antonio De Palo’s Italian drama following a struggle of true masks within the theatre. Precise movements and camera angles further projected the emotions of the characters into the audience. Perhaps one of the most beloved films of the day was LiFi. Tackling a culturally relevant issue with likable characters and nerdy comedy is difficult to pull off. However, the creators, Preston Peterson and Jason Boesch, were able to create a relaxed environment for the characters, and spike audience interest. During the Q&A session after block 2, they shared how they plan on stretching their ideas into a mini series. These short but meaningful films and untold stories are a can’t miss opportunity this weekend! Posted on April 11, 2014 by admin.